The multitouch trackpad and LED backlighting feel like necessary catch-up—they're less like "Pro" perks than they are standard technologies, so it's good to see them trickle down. Likewise, the spec bumps basically just keep up with inflation: the processor jumps from 2.13GHz to 2.26 GHz, the HDD from 160GB to 250GB, while the 2GB of DDR2 RAM has been swapped for the same amount of slightly faster DDR3 memory. And in the same divisive trade the 13" MacBook Pro made a few months back, the old removable battery has been switched out for the non-replaceable 7-hour unit. There was talk of an industrial design overhaul back in August, and that's what this refresh is really about. The bottom is now entirely rubberized, which seems to serve two purposes: One, to bring something, anything, visually new to Mac's unwittingly retro baseline laptop; and two, to bring some semblance of durability and friction to the the case, which to anyone who's watched a marred, scratched polycarb MacBook effortlessly slide off their corduroys onto the tile floor, probably sounds like a great idea. • The glass trackpad is the same size as the Pro's, and noticeably bigger than last gen's. • The edges are curvier, but again, the whole think feels chubbier. CUPERTINO, Calif., Oct. 20 /PRNewswire-FirstCall/ — Apple® today updated its popular MacBook® with a new, durable polycarbonate unibody design featuring a brilliant LED-backlit display, a glass Multi-Touch™ trackpad and Apple's innovative built-in battery for up to seven hours of battery life. Inheriting technology and design features from the MacBook Pro line, the new MacBook is an ideal consumer notebook for students and new Mac® users, and is available for $999. "The new MacBook includes many of the great features found on the innovative MacBook Pro, such as an LED-backlit display, glass Multi-Touch trackpad and built-in long-life battery," said Philip Schiller, Apple's senior vice president of Worldwide Product Marketing. "With the only lineup of notebooks all featuring unibody enclosures, LED-backlit displays and long-life battery technology, there's never been a better time to switch to a Mac." The new MacBook includes Apple's innovative built-in notebook battery for up to seven hours of wireless productivity on a single charge, and up to 1,000 recharges. * At nearly three times the lifespan of conventional notebook batteries, Apple's built-in battery results in fewer depleted batteries and less waste. Depleted batteries can be replaced for $129, which includes installation and environmentally responsible disposal of your old battery. The energy-efficient MacBook joins the industry's greenest lineup of notebooks, with every Mac notebook achieving EPEAT Gold** status and meeting Energy Star 5.0 requirements. The entire Mac notebook line now comes standard with energy efficient LED-backlit displays that are mercury-free and made with arsenic-free glass. Mac notebooks contain no brominated flame retardants, use internal cables and components that are PVC-free and are constructed of recyclable materials. Every Mac comes with Mac OS® X Snow Leopard®, the world's most advanced operating system, and iLife®, Apple's innovative suite of applications for managing photos, making movies and creating and learning to play music. Snow Leopard builds on a decade of OS X innovation and success with hundreds of refinements, new core technologies and out of the box support for Microsoft Exchange. iLife features iPhoto®, to easily organize and manage photos; iMovie® with powerful easy-to-use new features such as Precision Editor, video stabilization and advanced drag and drop; and GarageBand® which introduces a whole new way to help you learn to play piano and guitar. 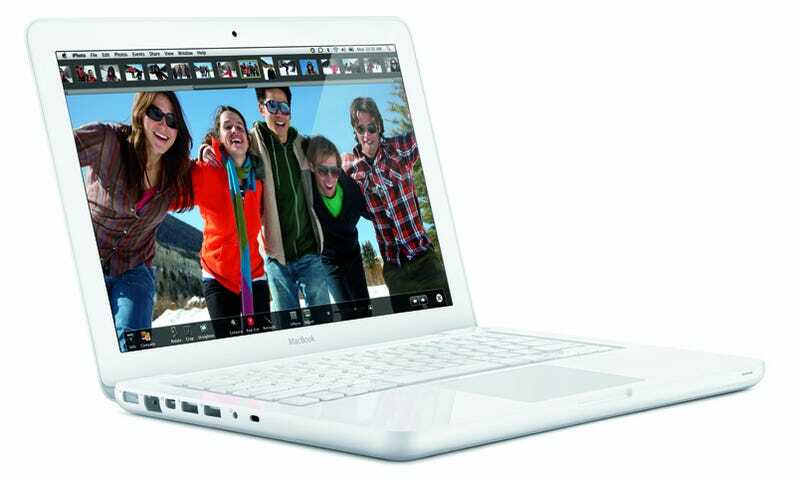 The new MacBook is available immediately through the Apple Store® (www.apple.com), Apple's retail stores and Apple Authorized Resellers. Build-to-order options for the MacBook include the ability to upgrade to 4GB 1066 MHz DDR3 SDRAM, or 320GB 5400 rpm, 500GB 5400 rpm hard drive, Mini DisplayPort to DVI Adapter, Mini DisplayPort to Dual-Link DVI Adapter (for 30-inch DVI display), Mini DisplayPort to VGA Adapter, Apple MagSafe Airline Adapter and the AppleCare Protection Plan.